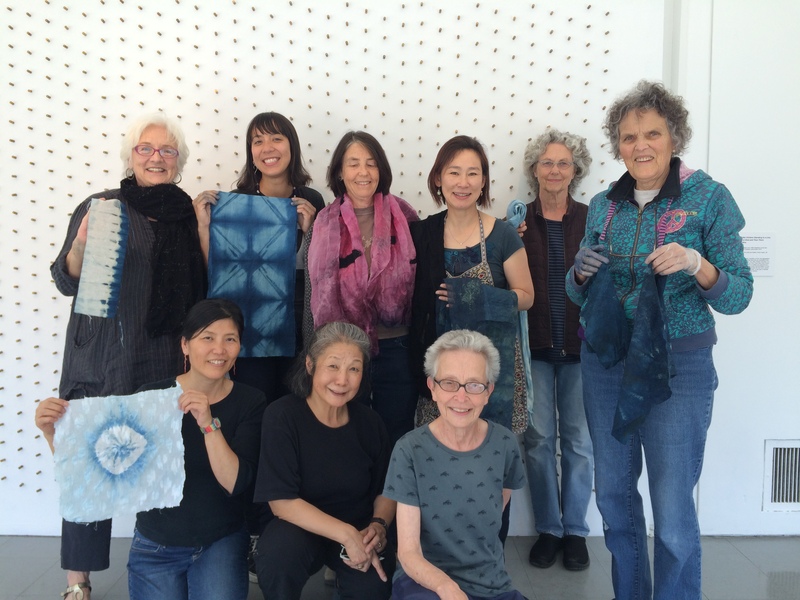 Last Saturday saw the conclusion of Yoshiko Wada‘s Boro workshops at the Richmond Art Center, where 20 eager participants had the unique opportunity to learn the history of boro, practice mending techniques and give their old garments a new lease of life! The first half of the 2-day workshop was spent discussing boro while showing vintage and special fabrics that Ms. Wada brought for the class to see, as well as some rare books. The second half focused on the “fulling” technique (not to be confused with felting) using imported Japanese wool and a special alginate resist paste, originally developed by Danish textile chemist Joy Boutrup. Once the material is immersed in alum, the resist paste becomes insoluble and the parts covered by the resist can withstand the fulling process. The final results were varied and interesting, with students using tape, stitching and stencils to create different resist shapes! Day 2 was all about show and tell. Participants were encouraged to craft their own unique language and expression, using materials that were available. Setting up two different types of organic indigo vat, using the famous 1-2-3 recipe as taught by Michel Garcia, was also on the agenda for Day 2. One vat was made was using henna and the other using fructose as reducing agents (to help remove the oxygen from the vat). Yoshiko also shared specific tips on how to oxidize the fabric to improve color steadfastness! A big shout out to the workshop assistant Martine Neider, Nicole Kite and Sarah Leverett from The Richmond Art Centre for their assistance and support! Our thanks to the wonderful participants – Pamela Belchamber, Lisa Marie Curie, Mary Gillis, Beth Anne Mahar, Kim Nelson, Heidi Page, Youngmin Pak, Janet Petroni, Jana Tuschman, Vanessa Wimmer, Joan Harris, Louisa Havstad, Gretchen Herbkersman, Barbara Klare, Youngmin Lee, Peggy Osterkamp, Rita Parks, Joanne Salz, Martha Walker – for making this workshop a huge success! Please bring this to the UK. I don’t know of anyone teaching these techniques over here and I’m fascinated by them. Thanks for your feedback. Unfortunately, we don’t have an upcoming event in the UK, but do check our blog for any announcements on workshops. You can also sign up for our newsletter, which includes information about workshops by our members. This entry was posted on 6 May 2015 by World Shibori Network and tagged bojagi, boro, indigo, kantha, mending, Michel Garcia, Natural Dyes, natural indigo, shibori, stitching, The Richmond Art Center, workshops, yoshiko wada.